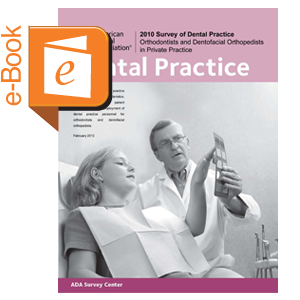 Report contains information on net income, gross billings, practice expenses, dentist characteristics, practice characteristics, patient characteristics, and employment of dental practice personnel for orthodontists and dentofacial orthopedists dentists. Based on surveys of specialists who were engaged in the private practice of dentistry as a primary occupation and who had been in their current practice for at least one year. Available for 1999, 2002, 2006, and 2010. This is a downloadable report, which is also available free of charge to ADA members at www.ada.org/freereports.